An online survey lists the resort island of Boracay as the best leisure destination in Asia, beating other favorites such as Bali in Indonesia and Sanya in China. Results of an online survey conducted by international magazine TravelWeekly listed the resort island of Boracay in Western Visayas as the best leisure destination in Asia, beating other favorites such as Bali in Indonesia and Sanya in China. The survey, called "Attractions that rock Asia," drew responses from 2.2 million viewers who participated in the online poll. 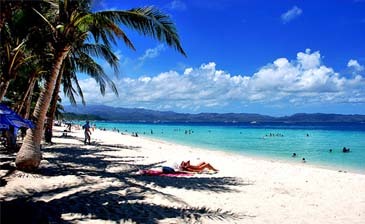 Boracay is the only Philippine destination nominated in the survey. No entry from the Philippines was included for other categories such as Best Business and Meetings Incentives and Conventions and Exhibits Destination, Best Cultural and Heritage Destination, and Best Eco-Tourism Destination. Reacting to the results of the online survey, Tourism Secretary Ace Durano said the resort island, which is a part of Aklan, continued to attract tourists because of its unrivalled beauty. He said the government was committed to intensify efforts to protect and preserve the natural charm of Boracay. The Tourism Department is implementing a master plan for Boracay that involves decongestion of the crowded White Beach and improving water services on the island. Durano earlier called for a moratorium of construction on the resort island, until a new land use plan was completed to guide new resorts development. He said Boracay continued to be the destination of choice by tourists because of its natural assets and the quality service provided by the tourist establishments there. In promoting a destination, the natural beauty of the site is not the only consideration. We also have to give top-notch service to make the stay of our guests both pleasurable and memorable so they will keep coming back," he said. Arrivals on the island last year grew 7.7 percent to 596,707. The tourism department expects some 700,000 tourists to visit the island this year because of greater availability of flights from Asian countries.